We want to thank everybody who contributed to the success of our national wide conference “Women* Breaking Borders” 22-24.09.17, and our conference kick of demonstration 21.09.17. Without all of you, it would not have been possible to have this conference this way. On Saturday, we were around 300 participating women*, 40 children and at least 50 people doing all the background work. Wow! Concerning the organization and infrastructure, there is always something to improve, but no one thought that things would go that smoothly. Thanks! Continue reading Thank you for supporting our Conference! With simultaneous translation into 7 languages!!! 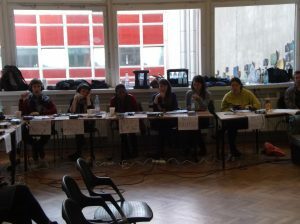 Thanks to all our wonderfol interpreters!!!!! For us, Women in Exile & Friends, the organizers of this conference, it is very important to bring to the attention of all participants, what we mean by borders. This is a solidarity empowerment conference for those who identify themselves as women* and for those who want to learn together with us in our workshops on how to dismantle racist and sexist borders. We have experienced borders from different areas, including borders between ourselves as refugees and/or refugees and supporters. 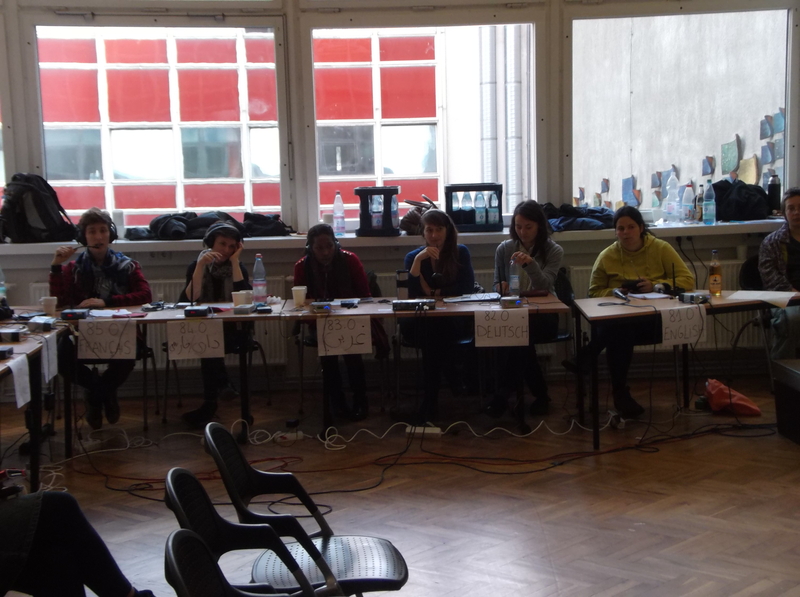 Some of us experienced gender borders as women* in our familes and in the society in our countries of origin. We also faced racist and sexist borders when we were crossing frontiers. Then the visible and invisible borders confronting us everyday in the Lagers in this country. The authorities divide us into wanted and unwanted refugees, those tolerated with no chance of staying, those with limited stay and those who should be integrated into the society, “but for how long”? Recently refugees from Afghanistan, Kosovo, and Iraq to mention just but a few, who were welcomed a few years back are being deported, though it is an open secret that these countries are far from safe. These divisions are meant to build hierarchies between refugees by making some feel that they have more rights than others and leaves others with the impression of being even more discriminated. For 15 years we have been fighting to change this political concept and we want to continue with your solidarity regardless of who you are or where you are from. Our aim is and has always been to enable refugees who identifying themselves as women* to stand up for our rights as women* living in this society. We call upon all of us to participate in this conference with an open mind, reflecting on our own prejudices and privileges. We declare no borders are high, low, wide or solid enough when women* unite. FEMINIST FIGHTS ARE FOR ALL OF US!!! 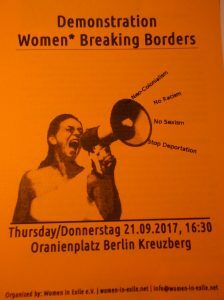 In solidarity with our conference from September 22-24, join our “Women* Breaking Borders” Demonstration and let’s get loud together. The politicians are changing the laws governing refugees weekly and make it more difficult to enter Europe. At the same time, they are trying to deport as many of us as possible, even risking injury and death. On the 24.09. those with the privilege of voting will cast their vote. We, who don’t have this right even if we are living in this society for years, ask you to join us in the streets and shout out loud and clear that NO BORDER WILL BE HIGH, DEEP, LONG OR SOLID ENOUGH TO STOP US IF WE COME UNITED! You can find a small flyer with several languages here. Please print and spread! We are looking forward to (refugee)women registering for the conference! 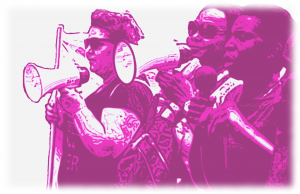 Women* Breaking Borders Conference: We are getting louder! Please download and distribute! We need your support! 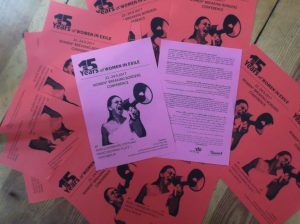 What: A conference organized by Women in Exile, Friends and sisters!!! To find strategies together on how to dismantle all borders eg. deportations, lagers etc. a) Why do they want to deport us!!! As refugee women we have experienced double discrimination, not only by the racist laws against refugees, but also as women. We are women living in this society but are denied our basic rights as women. The reality of refugee and migrant women in this society is made invisible, by only seeing us as victims without a voice. This happened after the events of New Year’s eve in Cologne in 2015, and it is happening again and again. Policy makers introduce new discriminative laws enforcing deportations in the name of “women’s rights”. Which women do they mean here? We, as Women in Exile and Friends strongly disagree with this kind of division among us. 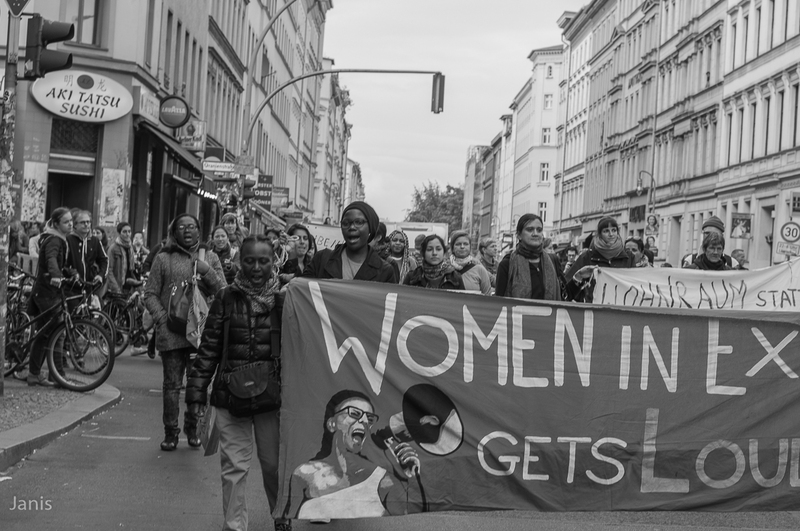 For centuries and decades, Women have been organising themselves to fight racism and sexism. Today women are organising ourselves for the same courses. These fights come from different groups which are discriminated and marginalised in the society, each group fights for the issues which affects them. There is a need to network and make “your fight, my fight”. Is it possible to learn from past experiences and mistakes? Recently the laws governing refugees have been changed, making it much easier to deport asylum seekers even the sick. The Dublin deportation system is reinforced. The European Union is trying to stop people from coming to Europe by all means. Instead of granting the Human Right to Asylum, people are treated as criminals as soon as they enter European ground. Even those who get married to German nationals have to proof that they are living together. Those with babies with German fathers are being scrutinized to an extent of being forced to do DNA`s. This means, the state is preaching integration but on the other hand doing everything possible to keep asylum seekers in constant fear of deportation. Often we are lacking the power, the contacts and information to deal with these problems. The „Asylbewerberleistungsgesetz“ was passed in 1993 to discourage asylum seekers from coming to or staying in Germany. It is racist and discriminating!! According to this “Asylbewerberleistungsgesetz” treatment of acute diseases or pain is covered. For any further medical treatment one needs to individually apply at the Sozialamt. This means that unqualified people decide on our health! Even though the new health insurance card was introduced in some regions, for special treatment we still need the permission of the Sozialamt and many doctors won’t treat us as soon as they see that we are refugees. Even according to “Asylbewerberleistungsgesetz” every woman has the right to see the gynecologist she chooses and to be assisted by a midwife during pregnancy, and after giving birth. Every pregnant woman can decide herself, how she wants to give birth, but because doctors get extra money for every caesarian section, they do the surgery without explanation or even informing refugee women and the women often don’t know about their rights. What are the possibilities of getting our dream job and/or having our formal education recognised in the labour market? Refugees have skills and qualification from their countries of origin but cannot proof this, because some couldn’t bring any documents with them. Those who managed to bring their documents with them need to translate and equate them to the Germany education system. This is a difficult, expensive and long process which leads refugees to take job offers which help them to integrate into the job market and probably to hinder deportation. In other words, jobs for survival, which at the end causes lots of frustrations. How can we defend ourselves from sexual violence? Women are generally confronted with physical and sexual violence in different areas for example in the lagers, places of work and also in social spaces by different perpetrators. It is important to be aware of the rights women have in these circumstances and how to prevent these violations. Women experience physical and sexual violence from their origin countries, encounter it on the dangerous routes to Germany and live it in the camps. 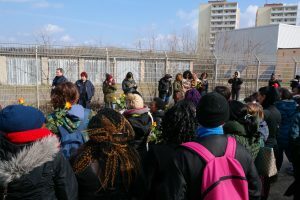 It is important to address racism, sexism and homophobia in connection with refugee movement. On the outside we try to have a united fight, but from inside there are a lot of divisions depending on privileges. Some of us practice racism, sexism and homophobia without even being aware of it. This comes sometimes from the refugee and sometimes from the supporters. It is important to know ones limitation in terms of support. Supporters sometimes spend a lot of energy trying to support individuals but forget that this cannot be forever and forget it is more important to empower these individuals: “do not give me fish but show me how to fish”. We refuse a concept of the supporter-supported relationship as one part only giving and the other only taking. Instead, we want to work on our own concept of working together in solidarity. Most camps are isolated and mostly situated in areas outside the cities where there are no regular transports or neighbours, surrounded by fences. The building differ from old military barracks, sport halls, containers , the new containers small villages, tents and of course the new renovated small houses in the middle of the cities. Inside the camps there is a lot of discrimination and racism between the residents. This causes conflicts which result in physical and sexual violence mostly directed against women. The lager accommodation system is supposed to discourage us and to isolate us from the rest of the society. We need to stand up for our rights as women living in this society. Please support “WomenBreaking Borders” conference! To enable refugee women* and children from all over Germany to participate in the national wide networking women* conference from September 21/22 – 24 in Berlin, we need your support! Please donate through our bank account or on betterplace.org!